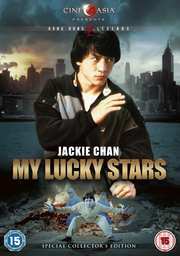 My Lucky Stars (Winners & Sinners 2) (1985) (Region 2) (Import) Sammo Hung with Jackie Chan and Sammo Hung . Hong Kong Legends is back, baby! A HK$ 30,000,000 Asian box-office smash-hit, featuring crackerjack comedy and groundbreaking action from three of the greatest Martial Arts Legends of all time: Jackie Chan, Sammo Hung & Yuen Biao. Jackie Chan heads up an all-star cast in this outrageous crime-caper involving two Hong-Kong cops sent to Tokyo to apprehend an ex-colleague and recover a fortune in stolen diamonds. When one is captured by the Yakuza-gang protecting the rogue cop, the other enlists the services of his shady orphanage buddies, including the irrepressible Fastbuck (Sammo Hung) to help break the case. Not surprisingly, all hell breaks loose, as the craziest assortment of degenerate misfits ever assembled embarks on a non-stop, anything-goes action-adventure which will have you reaching for the rewind button, time and time again!